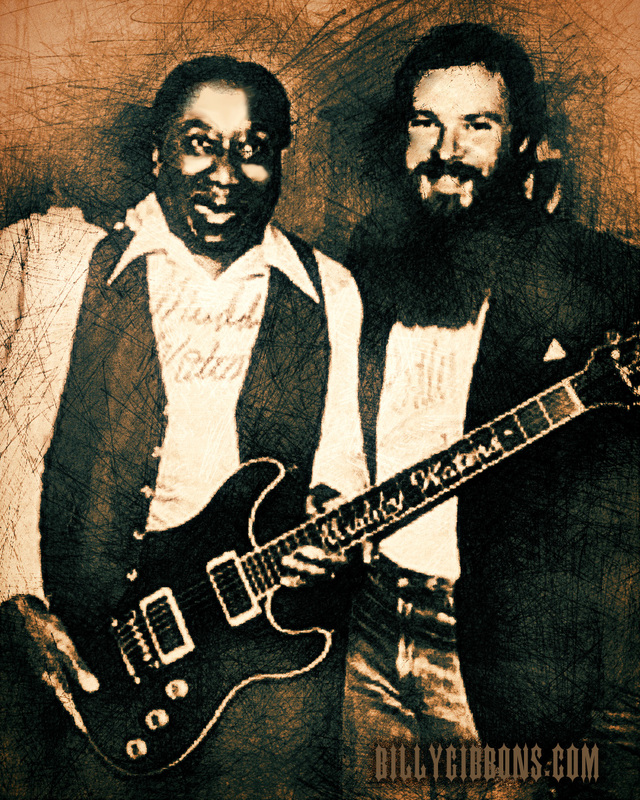 Muddy and his band opened for ZZ Top on a tour in 1981. This was over forty years after his first recordings, and that band could still play the blues, not just as seasoned pros but with the same enthusiasm Muddy had when he started out. When he sang that his mojo was working, you could tell his mojo had not slowed down at all. He was satisfied, composed, self-contained. If he had an opinion on a subject, he didn’t allow a whole lot of latitude to be convinced otherwise. If he was bitter about the way he’d been treated by record companies, he never showed it. We talked to him a lot as we traveled traveled, when he wasn’t chasing young girls through the airport. He told us a story once about his friends Freddie King and Little Walter walking from Dallas to Chicago. I’ve always had that image in my mind of two guys walking from the South to the North. Everyone else in the great migration took the train. I hope they weren’t carrying their equipment. Back in the late Sixties and early Seventies, this clamor started among musicians to go back to the authentic sounds of the Fifties, and they started paying outrageous prices for guitars of that era. People were always asking Muddy how he got this particular sound on a record and what instruments they were playing. Muddy’s answer was usually “Anything we could afford to get our hands on.” And sometimes they couldn’t afford it but they took it anyway. He told a story about Shakey Walter Horton and a friend of his who had a job as a cab dispatcher. One night at the end of the shift, they just took a wire cutter and snipped off the microphone, so they had something to play the harp through. That’s the authentic sound of the blues right there: a stolen cab dispatcher’s microphone. People call his sound raw and dirty and gritty, but it wasn’t particularly loud. It just sounded that way. A guitar amplifier in the Fifties was maybe the size of a tabletopradio. To be heard over a party, you had to crank that thing as loud as it would go. And then you left behind all semblance of circuit design and entered the elegant field of distortion that made everything so much deeper. If you didn’t have a big band with twenty guys, you had twenty watts. I first heard Muddy Waters through two friends of mine, Walter Baldwin and Steve Roberts, in junior high in 1962 or ’63. We grew up together and jumped on every piece of musical madness we could find. Most people in my generation probably discovered Muddy backwards from the Rolling Stones, who got their name from a Muddy song. I heard him just before the Stones got here, but it was all good, whether you discovered it backwards, forwards or sideways. Anyway, I picked up the guitar because of Muddy Waters as much as anyone. Jimmy Reed, Howlin’ Wolf, T-Bone Walker, Albert King, B. B. King, Freddie King — they all had an impact too, but they all followed Muddy Waters. He started out in Mississippi playing acoustic, using his thumb to play the bass line and a real bottleneck slide for melody on the upper strings. The slide guitar got the nuance of the human voice better than any other instrument. Basically, it was a Robert Johnson thing, and Muddy took it to Chicago, electrified it, added a bass player and a harp with a good backbeat, and you had a party. His bands were always powerhouses, and his voice had an amazing depth. The remarkable thing is that the blues never died out, ever. It’s been rediscovered every ten years since the Twenties. Nobody can do what Muddy did, but his energy is still fueling that fire. You can hear his enthusiasm in bands like the White Stripes or the Black Keys. I’d recommend his first album, The Best of Muddy Waters, with the early Chess singles, to anyone. “Honey Bee,” “Rollin’ Stone,” “Louisiana Blues,” “She Moves Me” — every track is worthy. The albums Johnny Winter produced in the late Seventies, Hard Again and I’m Ready, are also terrific. Johnny understood the music and caught the early Fifties ambience. It was all supposed to be disposable. Just noise on a shellac disc. And here we are in the twenty-first century still trying to figure out how such a simple art form could be so complicated and subtle. It’s still firing brain synapses around the world. You’ve got the Japanese Muddy Waters Society corresponding with fans in Sweden and England, and his music can still propel a party in the U.S. He made three chords sound deep, and they are. “I had phoned Jim O’Neil, founder of Living Blues magazine – he now lives in Mississippi – and accompanied him to the Delta Blues Museum in Clarksdale. It so happened that Sid Graves, the director, said he was making a trip to Stovall Farms, where Muddy Waters was raised, to inspect the cabin that was in danger of being taken down upon request of the Highway Department for safety reasons. The cabin had been hit by a tornado and they figured, well, it might fall down. “As we were looking about, the director picked up a piece of scrap lumber and said, `Why don’t you take a souvenir, here.’ There was quite a large beam left over, and we loaded it into the car. 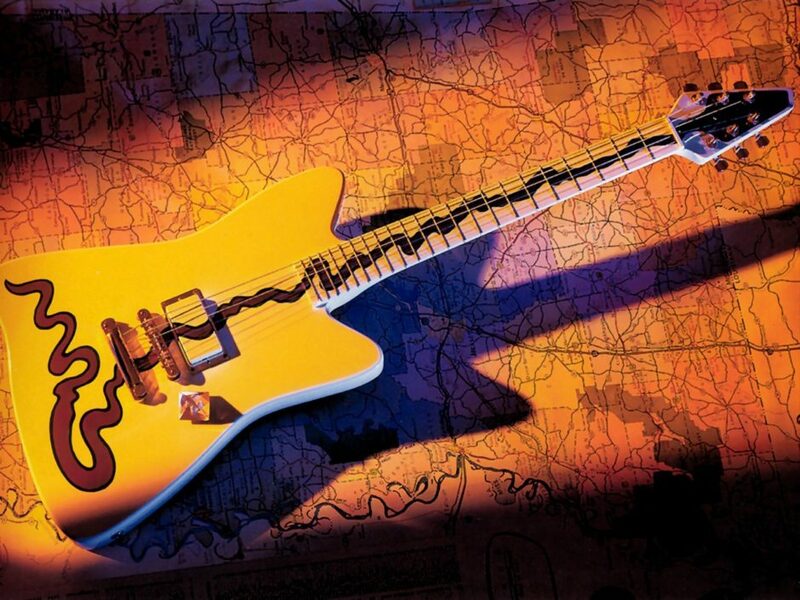 “I drove back to Memphis and I was speaking with Rick Rayburn and Rick Hancock, the proprietors of the Pyramid Guitar Co., and mentioned having this piece of wood. I said, why don’t we make a guitar out of it? They said sure, let’s have a look. “I unloaded it and left it with them, and two weeks later they called and said they had a couple of things in mind, why don’t I stop by? What kind of wood was this? What factors did you take into account in the design? Did Muddy play a similar guitar? “Yes, in the beginning I said let’s try to keep this design aesthetic as an instrument that would be usable as we might expect from Muddy Waters. And as we got near to the completion of the project, the decision was made to make it a donation to the museum. Rather that paint the instrument blue, we decided against that because it was just too corny. The Mississippi River paint scheme was applied to the instrument as a symbol of the power of what the river has come to be known and interpreted as. Certainly, it was the Mississippi River that gave the initial rise to the Delta, which of course became the fertile ground for the invention of the blues. I think it is awesome that Billy is sharing his encounters with musical greats from his journey through this genre. I have had the pleasure of meeting him on several occasions and he was always gracious and courteous. ZZ Top has & always will be my favorite band. I’ve been to Clarksdale many times. Usually stay at The Shake Up Inn, and frequent Ground Zero and Red’s Lounge. Saw Blind Mississippi Morris at Ground Zero once, and a year or so later at B.B.’s on Beale Street. Spoke with him at the bar and he asked where I was from. When I told him Waxahachie, he asked if Lightnin’ Hopkin’s Mother still lived there. I think you might have known another gentleman from my city…lol. Always wanted you guys to do a cover album; if so would love to hear you and Dusty cut loose on Bo’s “Roadrunner”. Keep the groove goin’ and never stop rockin’ no matter what they do, do, do, do or say! It story’s like these that keep the music alive. Keep’em coming BFG!! Shame the guy died in a little tiny maybe 500sq. House down the street from my ex-wife’s family in Westmont Ill. About 30 outside of Chicago. His wife his son Joe jr. and at least one daughter in that tiny house.My ex graduated in the same class in ’83 or 84′ in just a old working class neighborhood of a rich white suburb.She got in a fight in gym class or something with the daughter.My ex-father went down to straighten it out. Muddy broke out the champagne. My ex-pa said he was real down to earth. He died a couple years before I met my ex. The story and after I saw the house. It should still be there. About 3-4 streets west of Cass ave along the Burlington -northern tracks. Burlington st. If memory serves. Just kinda made me feel bad a guy with that much influence died in a little run down house. 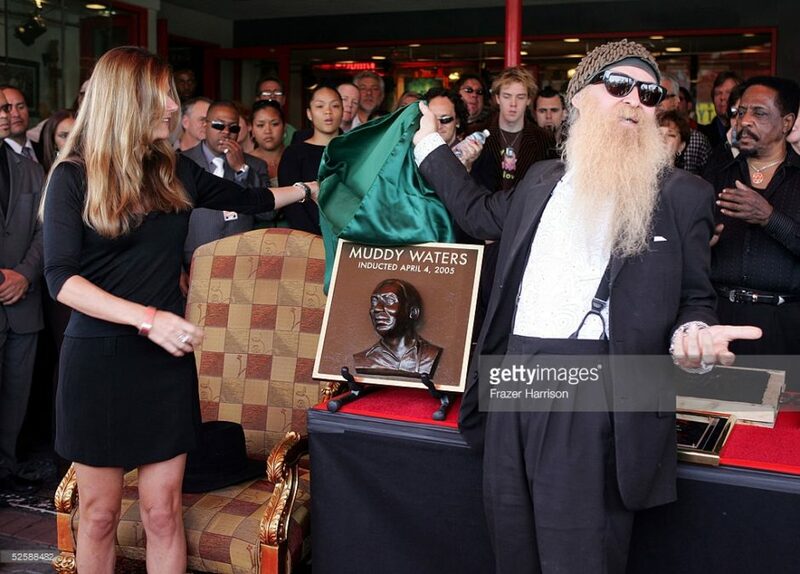 Just look at Billy’s grin on that photo with Muddy – says it all. I know how he must have felt, ‘cos that’s just what I was like when I met Billy in London last week! I’m just wonderin what Billy has to say about Roy Buchanan ? Often referred to as “The Greatest Guitar Player Never Known”.